Sparkling Crystal Bow Charm Bangle Just $9.99! Down From $140! Ships FREE! You are here: Home / Great Deals / Sparkling Crystal Bow Charm Bangle Just $9.99! Down From $140! Ships FREE! 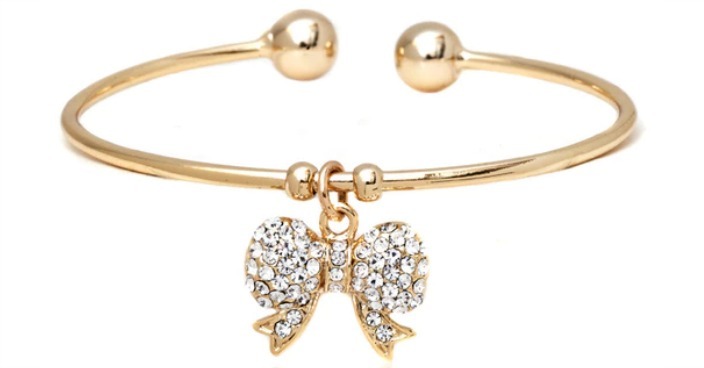 Tanga has this Sparkling Crystal Bow Charm Bangle for just $9.99 (Reg. $140) today only! Tie it all together with a charming pretty bow. Crafted in 18k gold plated brass, this bow-dazzling charm bangle features a cute bow charm paved with round-cut crystals made with Swarovski elements. A sparking nod to glamorous style. Approximate charm length: 0.8″. Guaranteed to retain its original gold content and color. Made in Brazil.